Okay, we know you guys are going to think we’re crazy and “how much sauerkraut can two people eat?” but we just can’t stop making the stuff! We know it seems ridiculous to have crock after crock fermenting on our kitchen counter but people we are addicted to the mystery of it all! And, our friends love us for it! Each batch behaves differently…it’s an experiment each and every time. You never know if it will co-operate to create enough liquid, will it bubble up to let you know it’s working, and all the different, tangy flavours… like this batch with the seeds…How will we know what we like the best if we don’t try them all!?! This time we are trying something a little bit different, a Savory Seed Kraut. It’s considered a low salt sauerkraut or it can be a salt free sauerkraut (for those of you trying to reduce your salt intake). For us, it started out being a salt free sauerkraut but this morning when we looked in on it and realized that the liquid was basically non-existant…we went back to the drawing board ~ or should we say back to Ellix Katz’s book Wild Fermentation. Upon further reading, we realized that you can add salt to these krauts (just add less). This will not only help the cabbage to create the liquid brine we need but it will also help to preserve it. Ellix Katz’s recommends doing these salt free or low salt Krauts in small batches because the fermentation process is quicker and the lifespan of the Kraut is diminished because it has little or no salt. That makes sense! But, of course, we did 15 pounds of cabbage instead of the recommended 5 pounds and are now adding some salt to help the cabbage create the brine and so that we will be able to preserve and process it in 4-6 weeks. In the end, this is what we did. Remove outer leaves of cabbage and thoroughly wash. 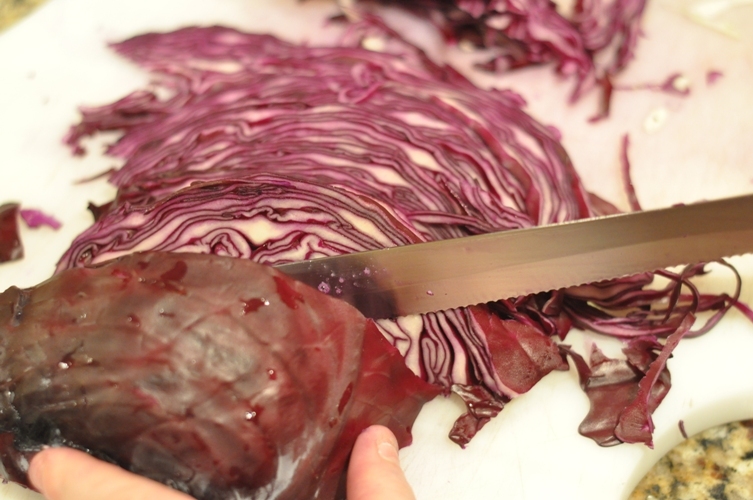 Using a serated knife (like a bread knife) cut the cabbage head in half, remove and discard the heart. Cut each half into very thin strips and place in a large bowl. Note: you can do this in a food processor but we like doing it by hand ~ a little bit more control on the finished product). 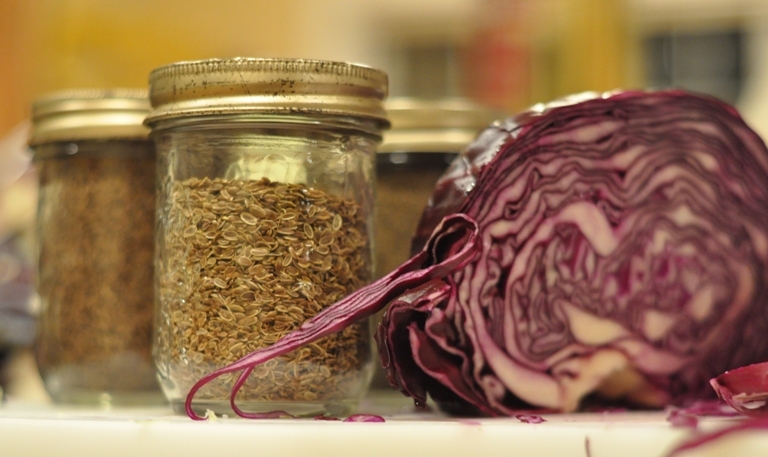 Working in batches mix the salt and finely ground seeds into the cabbage and pack into a crock or 4 x 1 Litre jars. Note: You may want to use the 1 litre/quart jars or a small crock if you are going to do a small batch. 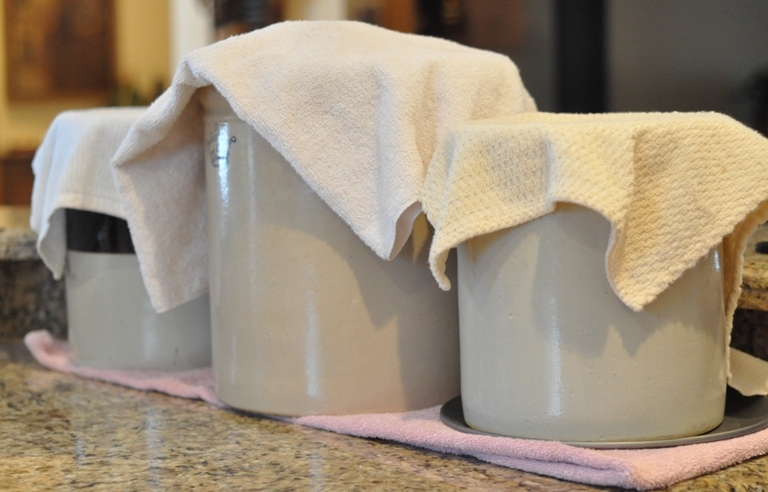 Again, we tripled the above recipe and used a large 4 gallon crock. Pack a bit into the crock at a time. Tamp it down using a potato masher or your fists…this will help release the water from the cabbage. Cover the kraut with a plate with a couple of 1litre jars of water on top to keep it down. Or, if you are packing your cabbage into 1litre jars ~ pack cabbage in wide mouth jars and place smaller jars filled with water in the opening. It is important to keep the cabbage submerged in the brine. 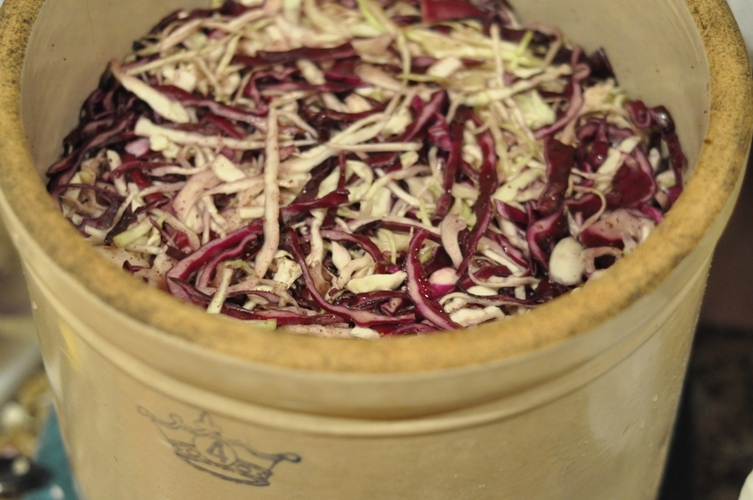 Press down on the jars or weight to force the liquid brine up over the cabbage and plate. It can take up to 24 hours for the liquid to rise but if it has not risen in that time add enough salt water to bring the levels up. 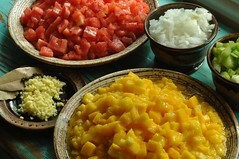 You can do this by adding 1 tbsp or less of salt to 1 cup of water ~ stir well until the salt is completely dissolved. Remember to use chlorine free water or boil the water first ~ chlorine inhibits the fermentation process. Older cabbage contains less water…so using fresh cabbage may eliminate the need to add additional salty water. Leave the crock to ferment. Remember to check it every day and skim off any bloom or scum on the top. Now, the above recipe outlines what we did (because we ended up adding some salt). However, you can do this without any salt at all…just add 1 cup of water to create the liquid/brine that covers the cabbage. And, be sure to use fresh cabbage or you may not get enough liquid. Again, it is a learning process but a tasty one at that! Sauerkraut with seeds! What an awesome idea! I’m beyond the point of temptation now. I’m going to try this! Where did you get your crocks from? We already had them…picked them up over the years. Can you believe it?…it’s like a calling!?! But, you could get a food safe plastic container from the local brew your own. Hey, can you offer some advice on skimming the scum? I had a hard time doing that when I made pickles, because when I removed the bowl I was using as a weight, all the pickles floated and all the scum went all over the pickles. I ended up dumping the whole thing through a strainer several times, which was quite labor intensive for 5 gallons of pickles. And the scum came back quickly, so I was having to try to get it off a lot. Am wondering if you have a scum skimming technique? Thanks!! Before removing the plate, I try to get as much of the scum off with a spoon (sometimes a slotted spoon). Then, I quickly lift the plate up trying carefully not to tilt and tip the filmy liquid back in…but, I don’t think this is quite the same problem you’re having…because the sauerkraut doesn’t float. I wonder about putting several layers of cheesecloth in ~ on top of the plate but under the weight and whether this would collect the scum? I don’t think there is too much need to worry about it…my experience is the more scum/bloom the better tasting the finished product…just try to remove as much as you can. When it’s fermenting well I have to skim the top every day. cool, thanks. i think i am going to start some sauerkraut soon, so the pickle scum won’t be an issue- until next summer anyway. thanks again!